Last week at the DoubleClick Leadership Summit, we announced the availability of Native Ads for Apps on our DoubleClick platforms. In this post, we’ll dive into the details of this new ad format and what it means for our clients. The mobile revolution has changed the way we engage with content. We check our phones literally hundreds of times a day: to catch up with friends and family, read an article, or watch a video while waiting in line. In these moments, we believe ads have the best chance to be effective when they are placed with respect to a user’s context. At Google, helping advertisers connect with the right audience in the right moments has been our aim from the beginning. From search ads complementing Google search results to TrueView ads on YouTube, we’ve found that the less disruptive we can make ads, the more open consumers are to them. That’s why we’re adding access to YouTube’s TrueView format and Twitter’s Promoted Tweets on DoubleClick Bid Manager, our programmatic platform. And now, we’re excited to help advertisers connect with publishers to bring rich native ad experiences to apps with our native ads solution in DoubleClick. Native ads fit in with the look and feel of publisher content, enabling better, more effective ad experiences for users. Context is incredibly important on mobile, and that’s why over the next few weeks we’re rolling out our native ad solution for apps to DoubleClick for Publishers clients globally. Native ads for apps in DFP provides publishers with the full flexibility needed to create seamless ad experiences for their users. Instead of serving a static banner ad, DFP delivers ad components (headline, image, links, etc) to a publisher’s app where they’re rendered into a native ad. By providing the building blocks of an ad, our native solution allows an advertiser to work with their DFP partners to create ads that are seamless with content, can take advantage of mobile features like swipe gestures and 3D animation, and can be adjusted to create beautiful ads for any device or screen size. Setting up native ads for apps with your DFP partners will be easy. Publishers that enable native ads will be able to offer two of the most popular mobile formats, app install ads or content ads, or create fully custom native ads by including any additional fields for DFP to send to their app. Of course, it’s essential that native ads are clearly marked as advertising. Ads that trick users into clicking or are indistinguishable from content are bad for the whole ecosystem including users, advertisers, and publishers. When users pick up their phones it’s critical that they’re presented with a seamless ad experience. With native ads in DFP, publishers can maintain a beautiful user experience in their apps while providing brands an opportunity to reach their audience on mobile. Advertisers should reach out to their publisher partners to find out how they can use native ads to connect with their customers and reach them when they’re most receptive. 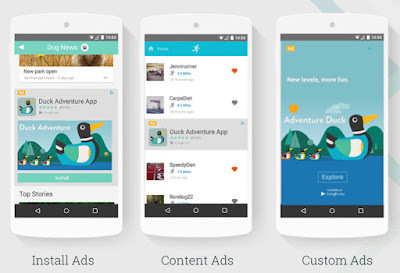 If you want to learn more about native ads in DoubleClick reach out to your account manager today. Also, visit the mobile solutions section of our website to see how DoubleClick can help you engage your audience on every screen.